دیوالی پر بنائی گئی ایک رنگولی , گوا, بھارت. A rangoli painted on the occasion of دیوالی, a popular ہندو festival. 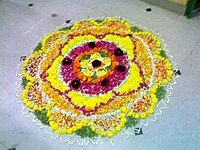 A rangoli made with flowers on the occasion of اونم.